The Loxahatchee Impoundment Landscape Assessment (LILA) is located on the grounds of the Arthur R. Marshall Loxahatchee National Wildlife Refuge in Boynton Beach, Florida. LILA is a working, 80-acre model of the Everglades ecosystem. 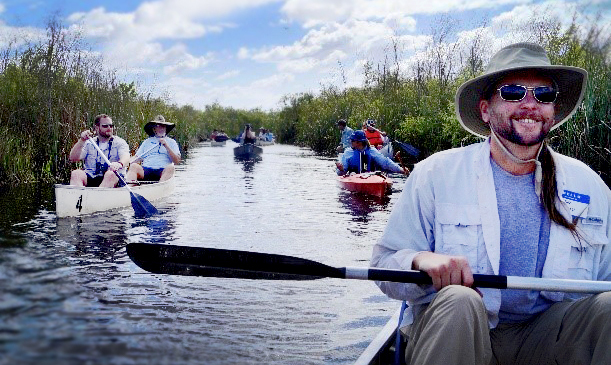 This "living laboratory" gives experts an opportunity to research and apply restoration techniques on a small, controlled scale before taking them into the 1.7 million-acre Everglades ecosystem. Because of the interactive nature of this field trip, attendance is limited to the first 15 registrants and advance registration is required. Indicate your interest in participating when completing online registration.Field trips are open exclusively to conference registrants. However, family members may sign up on-site at the conference if space is available. We Provide Transportation, lunch, refreshments and canoe rental with life jacket. You Bring Sunscreen, insect repellent, water bottle, old tennis shoes or water shoes that can get wet. Light clothing that dries quickly is ideal. Weather will be hot – dress accordingly. You may also want to bring a camera and binoculars. LILA tours entail about a 1.5 mile walk and include a tour of two tree islands and a walk around two macrocosms. Comfortable shoes are a must. March 16 or until the limit of 15 is reached. Refunds for cancellations will be issued until March 16, minus a $25.00 processing fee. Refunds will not be issued after March 16. NOTE: If an insufficient number of registrants sign up, field trip is subject to cancellation. If cancelled, you will receive a 100% refund.